Isn't That the American Flag They're Waving? Isn’t That the American Flag They’re Waving? America” protest flag sold by Adbusters, which first issued a call to occupy Wall Street last July. Not so. On hearing initial reports that OWS protesters were marching with the U.S. flag, we were also skeptical, until we repeatedly confirmed it. Yes, several flags have been the protest version, with the field of stars replaced by corporate symbols – itself an appeal to American nationalism. But in multiple marches, most of those red-white-and-blue flags have been the real stars and stripes, the bloody banner of U.S. imperialism as it lays waste to the world, from Afghanistan to Libya. And the flag-waving patriotic appeal is real. While there is a hodgepodge of political currents in the occupation, the common denominator is nationalist liberal populism, counterposed to working-class revolutionary internationalism. 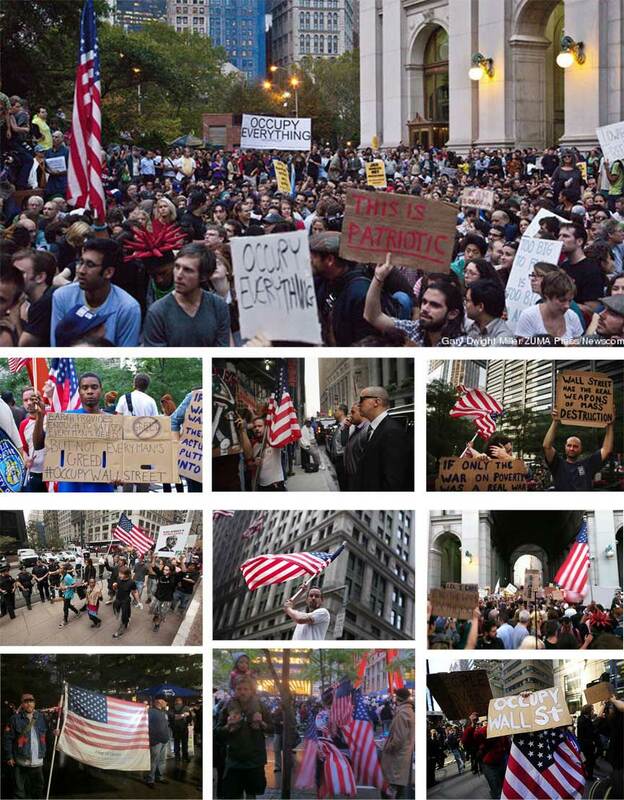 To back up our statement, we have put together a collage of photos showing numerous instances of the U.S. flag in OWS events in New York, which can be seen below. Photo details: From top, left to right: October 4 (Gary Dwight Miller/Zuma Press Newscom); September 26 (CC BY Sasha Kimmel); September 26 (Getty Images); September 6 (Spencer Platt/Getty Images); September 29 (Carolyn Cole/Los Angeles Times); September 30 (Kena Betancur/VP); September 30 (Washington Post); October 3 (Dan Patterson/Flickr); October 3 (Dan Patterson/Flickr); unidentified.